Flying buttresses are an architectural feature mainly seen used in medieval cathedral designs. First developed in Romanesque architecture and later perfected in Gothic architecture, flying buttresses are built projecting from the walls of a structure down to the foundation in an half arched shape. The purpose of such projections is to support the weight and horizontal thrust of the high arches and domes spanning the interior space. 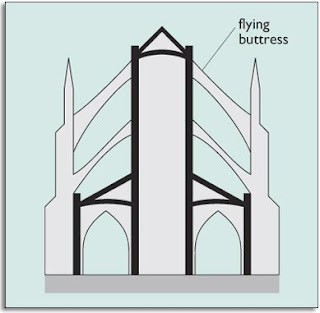 The flying buttress serves as a bridge, carrying the lateral thrust produced at the base of the arches and domes due to their weight, across to the outer buttress, which is massive enough to absorb the pressure (Watterson 103). The stability of the entire building depends upon the balance of pressures and with the existence of flying buttresses, cathedrals were able to be built taller and more glorious than ever before (Statham 370). Flying buttresses originated from the idea of internal buttresses used in Romanesque architecture dating back to the 10th century. Buttresses were used for support on the inside of the church walls because it was thought that such large flat structures were unfitting to be seen on the outside of the churches. Towards the end of the Romanesque period, as architects challenged one another to build churches and cathedrals higher than ever before, the use of flying buttresses on the outside of these structures became necessary. With the beginning of the Gothic period, flying buttresses not only became used more for their function, but for their appearance as well. Gothic architecture began in the 12th century in France and lasted until the 16th century. Mainly used in the construction of cathedrals, abbeys, and churches, the Gothic style is characterized by the pointed arch, the ribbed vault, and the use of flying buttresses. One of the first, and most famous, cathedrals to incorporate the use of flying buttresses was the Notre Dame Cathedral in Paris, France. Its construction began in 1163 and the cathedral was finally completed around the year 1345. 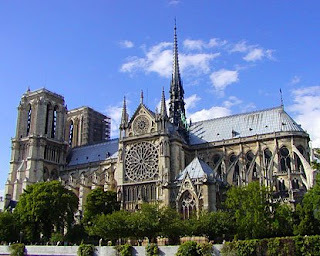 Many different architects and ideals went into the construction of Notre Dame. Flying buttresses were incorporated into the architecture for the primary use of balancing the pressure produced by such vaulted spaces. Another very important reason flying buttresses were used in the Notre Dame Cathedral was to allow adequate sunlight into the building (Temko 127). With such high walls and lack of windows the cathedral proved to be quite dark. Architects then realized that with the addition of more flying buttresses, they could place large stained glass windows along the walls of the cathedral to allow in more light. The incorporation of these large windows would further weaken the stability of the walls; however the strength of the flying buttresses solved such issues. Influenced by the architecture of Notre Dame, the architect of the Chartres Cathedral in France utilized the flying buttress to reorganize the whole appearance of the interior church structure and achieve a look of simplicity and coherence (Henderson 111). The cathedral was begun in the 12th century and went through a multitude of disasters including multiple fires before its final completion and dedication in 1260. Chartres stands with a nave of 120 feet, a south-west tower of 340 feet, and a north-west tower of 370 feet and contains 176 stained glass windows. 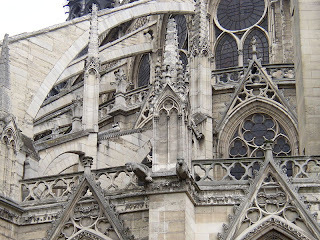 This magnificent feat and defiance of gravity was made possible by the abundant use of flying buttresses. Henderson, George. Chartres. Penguin Books. Baltimore, Md. 1968. Statham, H. Heathcote. A Short Critical History of Architecture. Charles Scribner’s Sons. New York, NY. 1927. Temko, Allan. Notre Dame of Paris. The Viking Press. New York, NY. 1955. Watterson, Joseph. Architecture: Five Thousand Years of Building. W.W. Norton and Company Inc. New York, NY. 1950. While on the Pressure + friction, the spring pushes the friction plate ... To make this blog post a little more interesting, I'll be focusing on the ... contact pressure, frictional forces, and the thermal response of the brake over time.